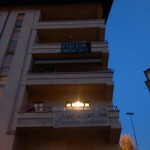 On the 24th of october we squatted a building in Trento, Italy. We need places to live differently and and where we can organize ourselves. The demonstration that those are not only our needs is proved by many and many people who joined the experience of the “Assillo” and “Villa Assillo”, places left empty for years that started to live again for months before the police came and evicted us destroying the roofs – because police fear our will to manage our own lives.